I have 2 boar brushes and my go to brush is the Italian made Zenith Short & Scubby 24x48 mm. It’s homage brush of the 2013 Barbear Classico Cerda by Semogue. Really enjoy it. I didn’t have a great experience with the SOC boar. It shed way too much and wasn’t kind to my soaps, so I sold it. Will probably move up to the Zenith B16, 24x57 mm or Zenith Pro 26x57 mm. I own a Mondial boar brush and I must say is very well made brush plenty of backbone and soft tips. Thanks for Sharing ! This was an excellent post I learned so much of boar brushes along with shaving techniques I can now see why my grandfather shaved with a boar brush in which I will continue to carry the tradition thank you again for a great post ! 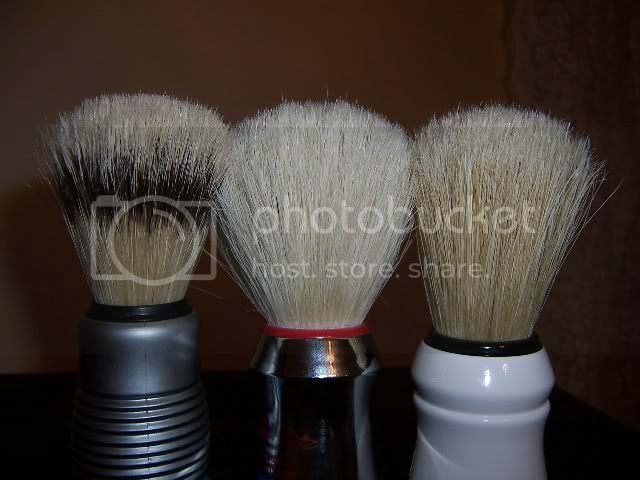 Another outstanding Zach's guide about boar shaving brushes.I must admit that after reading this guide I was hooked up with boar brushes. Thanks to Zach for giving me the chance to share it here. Boar bristles are very easy to come by, and cost far less than badger, which is a protected species in many parts of the world. The primary supplier of boar bristle is China, but there is a fair amount sourced from India and from Russia as well. Boar bristles are thicker and stronger than badger, but not nearly as flexible. Boar bristle will absorb water, whereas badger will shed water; badger, however can hold more water than boar, likely because of surface tension and water’s attraction to the greater quantity of the finer hairs in the badger brush. If you shake them out, however, they will both give up all the water that they held (minus the amount that the boar bristles have absorbed). One important point about boar bristles, which is very different from badger, is that a natural boar bristle will split, over time, into 2 or 3 individual ‘hair tips’ connected to the same thick shaft. This gives you the benefit of a finer, thinner and softer hair with the support of a thicker, firmer bristle. If the bristles have been clipped, however, this will not likely happen, as the bristle has likely been cut below the area that would normally split. Also, thinner boar bristles will split less and also less often as will their thicker counterparts. Boar bristles are thicker and stronger, so they are naturally a better choice with hard soaps. A softer and much more flexible badger hair will require more work and more time to extract the same quantity of soap, simply because it has less ‘bite’. To imagine this, consider how much soap a wire brush would remove from a puck, and the reason why this is so. It’s not nearly as extreme a correlation, of course, but the simple concept is the same. And it’s the reason why boar is referred to as ‘bristle’ and why badger is referred to as ‘hair’. Boar brushes hold less water. Why is this an advantage? Because even boar brushes hold more water than you will need, even boar brushes must be allowed to drain some water, or allowed some excess water to be shaken off. Too much water in the mix is the number one problem with bad lather. 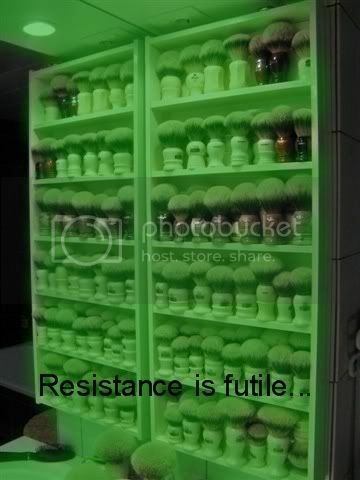 You’re far less likely to have this problem, simply by using a boar bristle brush. Stated more plainly: if a boar brush can hold too much water for lathering, and a badger brushes can hold WAY too much water, then the ability to hold more water becomes a risk to your lather. Boar brushes take longer to create a great lather. Why is this an advantage? Because of the simple fact that if you take more time to make lather, you’re more able to catch mistakes and compensate for them; also you won’t be as likely to miss the ‘sweet spot’ in your lather. A simple analogy is slow motion; if you can see things happening in slow motion, you can sidestep a potentially big problem. Boar brushes therefore allow for a more consistent lather than badger does; while this may mean nothing to an expert, recall the title of this post. Boar brushes are ideal for face lathering. Why is that? Well, because the lathering on the face part is not all about the face, it’s about the hair on your face. Boar works this hair harder, works lather into your pores and into your follicles better, and softens up the hair better by giving it a better workout. Also, contrary to popular belief, a boar brush, when wet, is not prickly, and when broken in, is soft and very easy on even sensitive skin. Boar brushes are somewhat ‘adjustable’. Since a boar brush will absorb water, if you let it soak in hot water for 5 minutes while you shower, you will get the softest shave possible with that brush. If you do not, however, you will get a stiffer shave. If you have 2 of the same boar and switch between them every other day, allowing the brushes 48 hours each to become bone dry, they will give you the stiffest shave possible for that brush. 4) Like to face lather? Boar brushes are not made like badger brushes. There is no manufacturer that will spare no expense to make the finest boar brush possible; you cannot spend $50 on a boar brush. While a small army and I are currently working very hard to bring you more boar of higher quality, still, I’ll never be able to talk the French into making a boar for you, and I did take 6 years of French, so it’s not for a lack of speaking French that I will fall short. The reason is more ‘complicated’ and completely mired in misconception, predilection, and sadly, condescension. This is a situation that a small army and I are fighting against, and the reason for this post. So, anyway, what do you look for? First, just get an Omega #48 professional brush, and get to know it. Then, once you understand it, you can get other boar brushes. You can get this brush, delivered, for under $20. The Omega professional is the standard brush by which all other boar are judged; that’s not to say that it’s the best boar brush, but it is the most popular, for good reason, and it is the reference that we can all use to compare. It has a 28mm knot of blond boar bristle; it’s fairly scrubby, even when broken in, and it can hold a copious amount of lather. The handle is extremely functional and useful; it’s made of ABS plastic and comes in chrome, gold, and chrome sketch. This is a very tall brush, over 5” tall. Unless you are specifically looking for a scratchy brush, don’t buy brushes with clipped bristles, like the Burma Shave brush, and the similar looking, newer stock Ever Ready brush; the Edwin Jagger boar is an exception here; scrubby but not annoying. Plan on using soap with your boar and lathering directly on the puck; if you plan to use cream, plan on using a mug or lathering in your hand. A heavier handle works better with boar, as it seems to go along with the added effort in lathering; Vulfix makes wonderful lathe turned handles, and Omega makes solid acrylic handles; these IMHO are best for boar. Also quite to my liking is solid wood; this adds a certain ambiance to the ‘old school’ atmosphere of traditional wet shaving that I am quite fond of. You can buy 5 boar brushes and have them delivered for less than 1 good badger, so if money is not an issue, buy a couple and take them for a spin; if money is an issue, get the #48 which is under $20 delivered. If money is really a problem, get a <$3 Delong brush from China, which has a hard to use and cheap plastic handle, but, does lather pretty well. And save $1 a week for 5 months and get the Omega. And do NOT buy that shave soap offered on that site!! (And don’t buy that brush, either, unless you need to, it’s not a good brush, but the knot (thought small) is not complete crap, either. First, rinse the brush under a stream of hot tap water for 1-2 mins, pretending it’s full of soap. This to rinse off anything on the surface of the hairs. Next, get a very clean mug; boil some water. Place the brush in the empty mug, bristles down, and eyeball it so that you know more or less exactly how much water to put into the mug to coat the bristles right up to the ring; take the brush out. Fill the mug with boiling water to the mark you made in your head. If you have an instant read thermometer you want 165 degrees, enough to kill germs; if you do not, wait about 5-7 mins or so. Place the brush in the water, and let it sit for 5 mins. You will notice how the tip that was once tapered is now splayed out; this is key; you need this separation of bristle to destink the brush. Add about ½ teaspoon of borax to the water; if you don’t have borax, you can use a couple of drops of shampoo for hair. The reason why you waited the first 5 mins with plain water was so that the brush, which absorbs water, does not absorb any soap nor funk (I have been doing this for years). Now grasp the brush handle between your palms like a stick of wood that you’re going to start a fire with; rub your palms briskly with the brush between them so that the brush spins in the water like a washing machine agitator; if this is messy or uncomfortable just twist it back and forth with your hand; agitate for a good minute, then rinse under running water; you can shave with it now or save it for tomorrow. Now I know that this super hot water thing is controversial; but this is exactly what I do. I know that Giovanni disagrees with me on this one, and he has been told by at least one brush manufacturer to NOT expose the knot to water, much less really hot water. Boreal, for example, writes on the box itself to not submerge the brush underwater. And maybe I would too, if I were a brush manufacturer. Gio's recommendation for disinfecting the brush would be to rinse it in a 50% solution of water and Listerine, followed by a quick wash with baby shampoo; you might want to try this; for sure it would be more gentle on the brush. A badger brush is ready to run, right out of the box. Let’s say that it’s 90% of everything that it will ever become on the first use. The boar brush is NOT. It’s a different brush in a week, and again in a month, and again in 3 months. The boar takes 3 months of use to reach 90%. The brush will soften immensely over time, and work much better as well, across the board; your patience will be rewarded with great shaves and a lot of satisfaction. Lathering means a lot of different things to different people. Some people like an airy, huge meringue of lather; others like a paste; some like watery lather, others a dry lather. Some like a bowl, others a hand, some like to face lather, and some like a shave stick. So, for the purposes of making you happy, of course, do as you see fit; for the purposes of this thread, however, I will offer what I think makes the best shave: a thick, protective, and slick layer of soap. If you read this thread you’ll know how I feel about the topic of soap. Use it, and use a lot of it. Lather up before the first pass, then rinse with hot water and re-lather for each subsequent pass. You don’t need less protection for your second or third pass, you need more; you’ve just scraped a layer of skin off your face with a blade. Use a lot of soap! So with the boar, you’ll notice that it pretty much holds the right amount of water with little help. For the sake of consistency, don’t run your brush under a stream of water, submerge it instead in a cup of hot water. Remove it from the water, and start using it once it’s done dripping; this is the amount of water you want. You will use this water to create lather; the lather will be too wet. Use this wet lather to make better lather, do not shave with this lather. This lather is high water content, and just keep capturing it with the brush and working it into the soap, pulling off more and more soap into your mix, making a thicker and thicker lather, up until the point where you have a brush that’s fully loaded with cream, and you can then use this on your face. I did make a video on this topic. I will make more, as well, and keep them on the same channel. Lathering a cream with a boar is easy to do, however, unlike a soap, it's not completely idiot proof. With a soap, you can't have too much water; with a cream, you sure can; with cream it's more important that you start out with the right amount of water. The best way to assure consistent results with a cream is to start off a little dry, and then wet the tips of the brush to add more water when necessary. 1) Use a bowl, and place an amount of cream in the bowl. Depending on the cream and the size of your brush, this might be an almond sized amount, or more for some creams. Take the wet brush out of the mug, or run it under water if you like, and hold it until it stops dripping, then give it one good shake. Start working the cream at this time. If you like a thick cream, you can work it for 15 seconds in the bowl, then bring it directly to your wet face, and continue working it on your face for at least 30 seconds, up to a minute if you like. Finish with a painting stroke to even it all out. If you need more water, after having worked the cream onto your face, dip the tips (let's say 1/2" to 3/4" of the tips) into some hot water, and bring that back to your face, and quickly run it over your face to evenly add the moisture, and then continue working it into your beard. If you like a fluffy lather, you can work the lather in the bowl for 1-2 minutes, adding water as necessary, until you have built up a mug full of lather, and then apply that to your face. If you like a wet lather, work it in the mug as above, with more water. 2) You can add the dollop of cream into the palm of your hand, and with the wet brush as above (full brush with 1 big shake) start to make lather in the palm of your hand. Continue this for 20-30 seconds; take the soapy palm of your hand and wipe it onto your wet face, followed by the brush, lathering onto your face. If you need more water, dip the tips into some hot water, bring the brush to your face, then quickly and evenly distribute the water, and continue to work the lather; finish off with a painting stroke to even it all out. 3) Dip your wet brush directly into your tub of cream; take the wet brush, invert the tub of cream and swirl your brush into the cream, upside down, until you have a nice load onto your brush; the reason for doing this upside down is so that you don't accidentally dilute your cream with water from the brush. Take this brush directly to your wet face, work it into your face for a minute or so. If you need more water, dip the tips into some hot water, bring the brush to your face, and then quickly and evenly distribute the water, and continue working the lather; finish off with a painting stroke to even it all out. 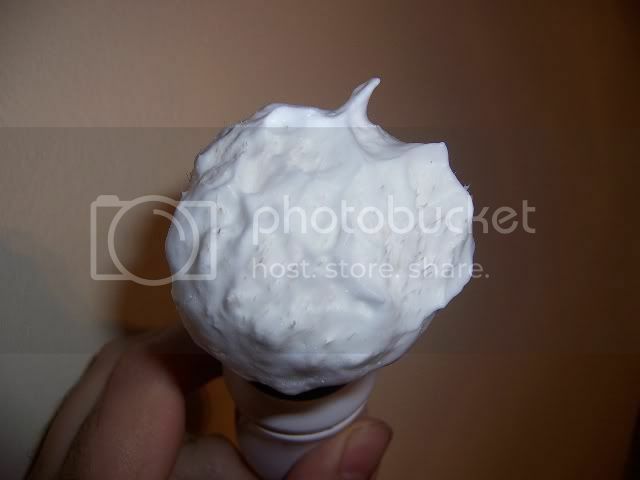 4) Spread the cream directly onto your wet face, like using a shave stick, and lather it with a wet brush. This is a very easy and very effective way to lather a cream with any brush, however, if you have sensitive skin, it's not a good idea with some soaps that can be irritating, for example, Trumper Violet. Other creams can also be drying in this high concentration; you'll have to experiment with what works for you. No matter which method you use, start out with a dryer brush, and add water if needed. The more water you use, and the more air you whip into your soap, the more lather you will create; this lather may look impressive, but it's not good for shaving. A badger brush, with its finer hairs, can whip more air into a lather than a boar can, and can make a more impressive looking lather. If you have too wet a lather, you can add more cream to compensate. If you are running out of soap for a touchup pass, you can squeeze the bristles from the knot out to the tips, moving the trapped soap back to where you can use it. If you like a warm lather with your cream, use the mug method; let the mug soak in hot water to absorb its heat, and this heat can be transferred to your dollop of cream. The worst method would be brush directly into pot of cream, directly to your face; this will be cold. For the best possible hot lather with a cream, of course, invest in a scuttle. A good boar brush won’t last as long as a good badger brush, and there are three reasons for this. First, boar bushes (although not nearly true on this forum) are a quantity item, whereas badger brushes are a quality item. Now before you (and you know who you are) go quoting this sentence and adding “Well, Zach, on this point we agree” keep in mind this fact: there are people out there that are spending every imaginable ounce of energy to make the very best badger brush possible, sparing no expense, and there are more people that are competing with these people. Boar is not so; boar is for the masses, and as such is produced en masse. Badger is for the (let’s just say more selective to be polite) and are built in a (more discerning) manner. Oh, and they are priced accordingly. 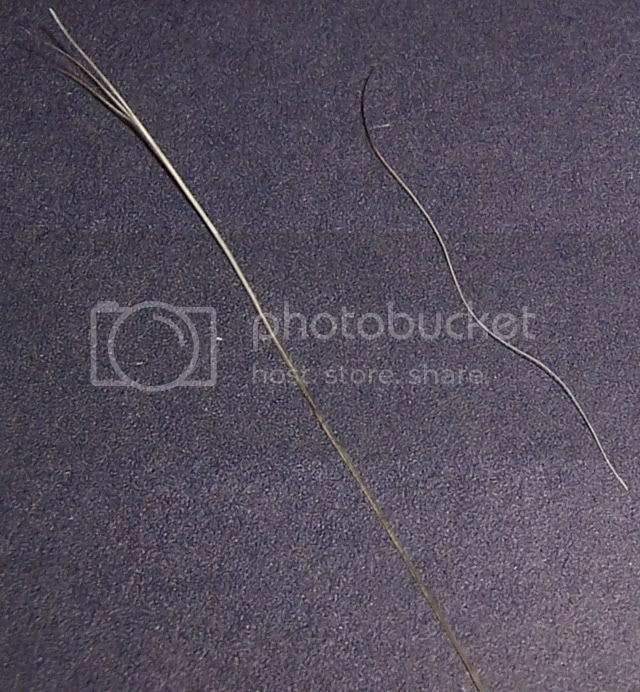 Second, because the bristle is thicker and less flexible, it will break after some time. After a couple of years of use, what you think is shedding is more likely breaking at the area around the top of the knot, due to flexing. Third, because the bristle is thicker, they naturally take up more space in the knot, space where there might be glue otherwise; the holes in the glue knot are larger, therefore, so the glue now has less glue in it, and is therefore more prone to breaking than a badger knot. Omega puts their glue knot into a plastic ‘cup’ to help counteract this, but most do not (Kent, Vulfix, and every single $5 brush). Still expect to use a boar for 10 years or so, but, bottom line, it won’t last as long as badger. 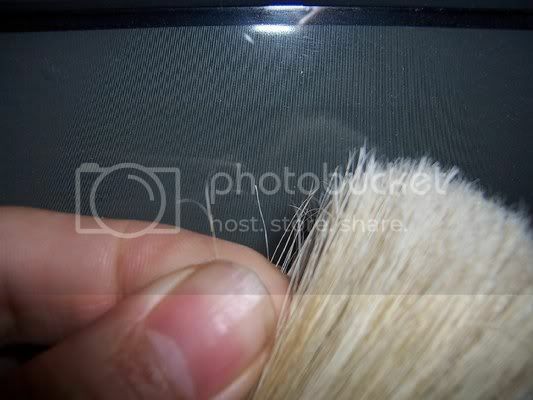 With regard to the care of your brush, after the initial cleaning, you can use your brush as you would any other brush. The boar brush doesn’t tend to cake up and require cleaning nearly as often as the badger brush, however, if you like, you can clean it, but, since the bristle will absorb water, be careful of what you use, and of how long you use it. I find that using superheated water as a soak and spin will do just as much good as a borax soak. Boil some water, and then let it cool, till it’s about 165 degrees; then soak, and spin. By spin, I mean just that. Let the brush soak till the bristles splay, then twist it really fast via the rubbing together of your palms, or any means you have to make keep the handle in one place but still spinning back and forth like the agitator of a washing machine. If you buy a used boar brush and for whatever reason intend to use it, go with 175 degree water to kill as many germs as possible, and a borax soak. Follow the ‘how to clean your new brush’ instructions. If especially funky you might want to use the hot water / borax solution with an ultrasonic cleaner; this is the best you can do. With vintage brushes, be careful of the knot, if the brush looks old and dried up, there’s a good chance that the knot can crack. If so, just make use of the handle and replace the knot with a badger knot. New addition: boar brushes absorb water, and badger does not. It's very important to not let your boar brush dry with a load of lather in it; this soap will be absorbed into the bristle and subsequently when the brush dries after rinsing it will feel stiff and inflexible; also, after years of service, if you don't rinse them well after use, a boar brush will eventually become dryer and inflexible. It's important that you soak this brush before use, then rinse well and let dry, soaking before each use for at least a month in an effort to try to remedy the damage. If you use a brush in this condition, you stand a very good chance of breaking bristles, and possibly even cracking the knot. FYI, the availability of replacement boar knots is next on my list, once the March dust settles. As always, I will never be selling anything, nor profiting in any way from anything I say, or do, or recommend. I have read all these things on the boards (not just this one) many times. What’s the best way for me to break in my boar brush? But what if I want to break it in faster? What if I can’t wait? I’ve heard a lot of great things about boar brushes; if these are true, then why are they not more popular? -	The thoughts and ideas on this and most shave forums are a collective; they formed at the same time and have been built upon. They are the hive mind; you are told something, and you tell people, and when enough people believe it, it becomes de facto. The truth is that in most parts of the world where people use a brush to shave, people use boar. It is that popular, it always has been. What is the absolute best boar brush on the market? Isn’t it true that the only reason why people use boar is because it’s cheaper? Like, barbers are notoriously cheap, and so, they use boar, because they are cheap, right? Wouldn’t it make me cheap / doesn’t it make you cheap to use boar? I have a $500 super white brush and I’m afraid to use it; I’m afraid of twisting the hairs together causing them to fall out; I’m afraid of dipping it into anything that has any color in it for fear of coloring the super white bristles. I worry a lot about the knot and the care of the knot, and I only let it dry in a stand to protect the knot. I’m not sure of the best way to dry it, how much to shake it, should I towel it off, can I use it again if it’s still damp, and I also worry about mold. I live in fear of dropping it so that I might crack or splinter the handle; basically, I am afraid to use this brush and I have stress every single morning while I prepare to shave. Can you help me, Mr. Boar Man?? IMO, the boar vs. badger debate is similar to the soap vs. cream debate. Each category is different, but each is perfectly suitable for the task at hand. I agree; use what makes you happy. I use boar for several reasons; the most obvious is that this is how my father taught me, and this is what I have always used. The second is because for me, it works better. And I like to use soap, and I like to use a lot of soap, and I like to load up between passes. But I also like cream, and a broken in 31064 does not fall short with this task, and the Trumper feels just as luxurious with the Omega as it does with the Simpson. And I’m very lucky to know that and to be able to say that. I like everything that I acquire to suit me and not the other way around, and I don’t believe that anything that I acquire makes a statement about who I am. I am what I am, I cannot be made into anything else. If you feel this way too, I encourage you to try an old school boar brush! Mike Ham have used some parts of this article for his books.Thanks to Zach and Mike for divulging really nice information about wet shaving. wow what a hit! Zach's work has launched 1,000 boars. if Zach wrote more like this, it would be great to have all of his work in one place.